Mr. Knox has been active in the swimming pool industry since 1970. 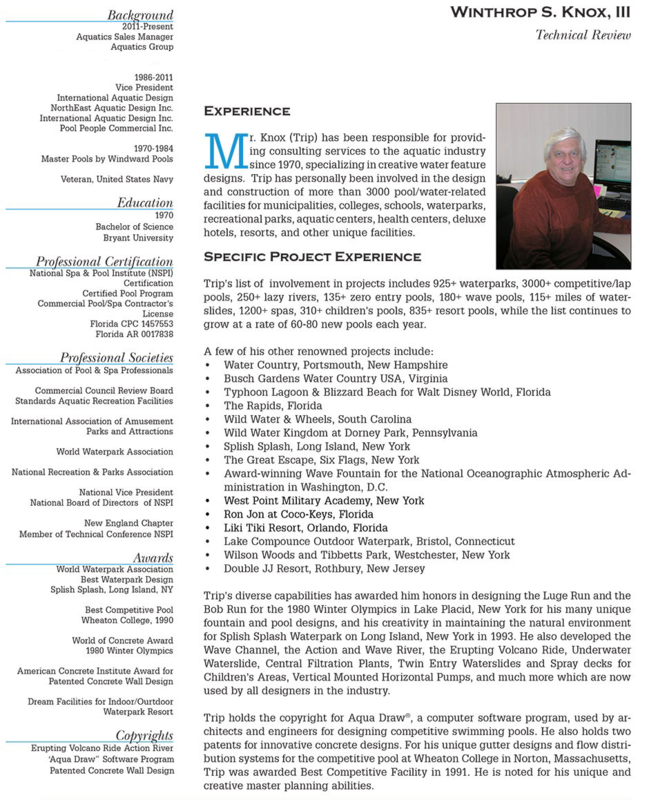 As Senior Design Consultant and Principal for NorthEast Aquatic Design & Supply, Inc., Winthrop Knox has provided consulting, design, and construction services for more than 3,000 pool/water related facilities for municipalities, colleges, schools, waterparks, recreational parks, aquatic centers, health centers, deluxe hotels, resorts, and other unique projects. Throughout his career, Mr. Knox has received many honors and awards for his creative designs, including the Luge and Bob Run for the 1980 Winter Olympics in Lake Placid, New York, and Splish Splash Waterpark on Long Island, New York, in 1993. Mr. Knox was also responsible for developing many original innovations, which today are considered industry staples such as the Wave Channel, the Action and Wave River, the Erupting Volcano Ride, Underwater Waterslide, Central Filtration Plants, Twin Entry Children’s Area and Vertical Mounted Horizontal Pumps. Having been the first registered certified member of National Spa and Pool Institute, he also served on the National Board of Directors as National Vice President for the New England Chapter of NSPI. Contact our consulting firm to learn more about our history and past projects we have worked on.